Steam the cauliflower until tender. While cauliflower is steaming, dice the onion and saute in butter until clear. Add ground beef, beef stock, thyme, rosemary, mustard powder, chili powder, poultry seasoning, garlic, and salt and pepper to taste. Heat over medium until beef is well done. Add thickening agent and pour into 9 inch deep dish pie plate. When cauliflower is tender place it into a food processor with 1/2 stick of butter, some heavy cream (start out with 1 tablespoon or so and check consistency), salt, and pepper. Beat until smooth and creamy. Season to taste. Dollop onto beef mixture and place in the oven for 30 minutes or until nice and bubbly and the mashed cauliflower is browned. Cauliflower works well as a substitute for potatoes in this traditional Irish dish , which was first mentioned in 1870s and likely came about as a means of using up leftovers . 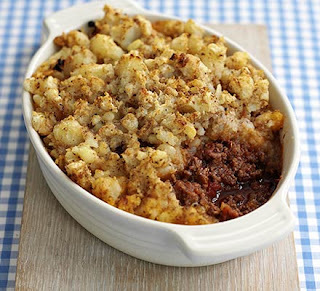 This version, which uses cauliflower in place of the more traditional potatoes, tastes great and has some added health benefits that you won't find in traditional shepherd's pie! Note: If you are vegetarian, you could substitute the grass-fed beef with vegetarian meat substitute. Megan Rostollan is a Certified Family Herbalist and works with her husband David, a private natural health and nutritional consultant (www.reforminghealth.com). Her areas of greatest interest include women's reproductive and prenatal health, as well as organic and green living and dietary and lifestyle changes.